While you and your partner are undergoing fertility treatments, your life doesn’t have to come to a grinding halt. Your journey to starting a family is one that should be accomplished alongside your daily life–a milestone marked with new and exciting opportunities, rather than challenging roadblocks. After all, the journey that led you to seek treatment has undoubtedly been trying enough. If you are traveling for an extended period of time, make sure you have medication to last through the duration of your trip or arrange for refills you can pick up at your destination. Talk to your doctor well in advance, as there may be requirements or restrictions regarding sending prescriptions to other states or countries. Be sure to also ask your fertility specialist for a doctor’s note to have in case your airline or travel service requests one. The last thing you want is to be told you can’t travel with certain medications or supplies. Call your airline ahead of time, especially for overseas travel, to find out what policies your particular airline has in regards to medical supplies. Each airline is different, so don’t assume the same policies apply if you’ve previously flown with another carrier. 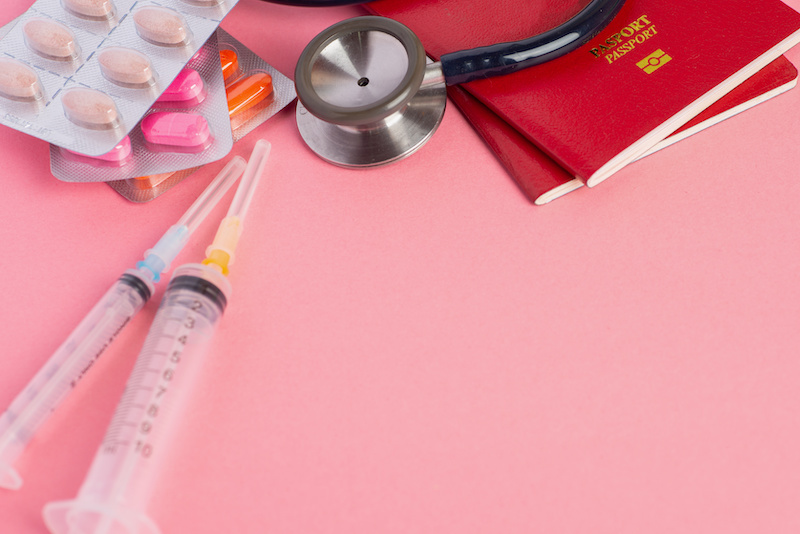 Although you can travel with medical supplies and medications, it doesn’t mean that there aren’t stipulations as to how to carry these especially considering you may be storing various medications and syringes. Some airlines may require you to carry your medical supplies in particular types of bags while others will require you to put the supplies in your luggage rather than in your carry-on. Finding this information out ahead of time can save you time and frustration, helping to make for a more enjoyable trip. While you may be required to store some administration supplies in a checked bag, keep your medications stored in your carry-on, as this is the safest place to prevent theft, misplacement, and damage. In addition to airline requirements regarding how you pack them, all of your medications require special instructions regarding how they should be stored. Some will need to be stored in a chilled environment, whereas others have to be kept at room temperature. If you are traveling with a round of IVF medications, pack a small, insulated bag with an ice pack to keep them cool until you can properly store them once you arrive at your destination. A zippered pouch that you can tuck into your carry-on may be helpful for other medications and supplies so that they are separate, but still easily accessible. Make sure it’s large enough to accommodate your necessary supplies such as alcohol wipes, gauze pads, syringes and a sharps container for proper disposal. Consult with your fertility specialists to ask for advice regarding your specification medications. Rosemont Pharmacy also provides this helpful resource that explains the storage instructions for many fertility medications. The Transportation Security Administration (TSA) has a helpful video on their website with information about traveling with medication and the airport checkpoint screening process. They also have a dedicated helpline to answer any questions you may have. It is recommended that you call 72 hours prior to your departure. While medications and medically-necessary supplies are exempt from many of the normal restrictions, you should always notify TSA personnel before you begin the screening process and let them know if you’d these items to be reviewed with an alternative screening process versus passing through the X-ray machine. If you are traveling to a different time zone, consult with your fertility specialist about whether adjustments to your medication schedule are needed to accommodate. Since your smartphone should automatically update the time based on your location, you may find it helpful to set reminders or alerts on your phone about when to take your medication. Being away from home and your normal routine can make it easy to forget. Whether traveling for work or just for fun, you can count on support from Carolinas Fertility Institute. We understand that the stress of undergoing fertility treatments can be overwhelming, and taking a trip to unwind and recharge can be beneficial for restoring your energy for the remaining road ahead. Our team of fertility specialists are here to answer any questions you may have, offer helpful advice and guide you every step of the way.